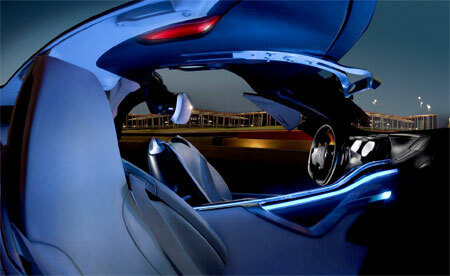 This is the Citroen C-MÃ©tisse Concept car, to be shown at the Paris Motor Show later this month. The Citroen C-MÃ©tisse Concept combines the features of a high performance sports car together with environmental friendliness – this means a top speed of 250km/h but using only 5.2 litres of diesel per 100km. Classic Citroen design cues are kept – long bonnets and non-existant rear overhang, most Citroens like the C4, Xsara and Xantia look like notchbacks. More details after the jump. 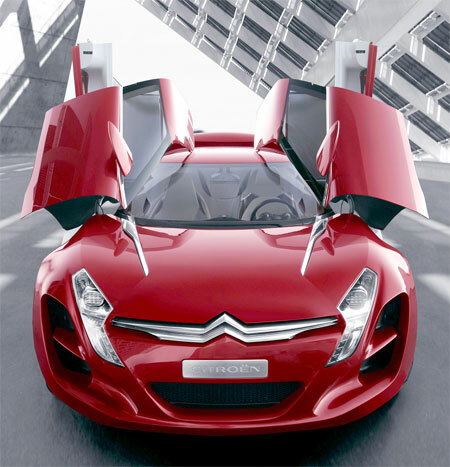 The Citroen C-MÃ©tisse Concept car is a 4-seater, 4-door coupe powered by a Citroen HDi V6 turbodiesel engine equipped with a Diesel Particulate Filter System, as well as two electric motors powering of the rear wheels each. 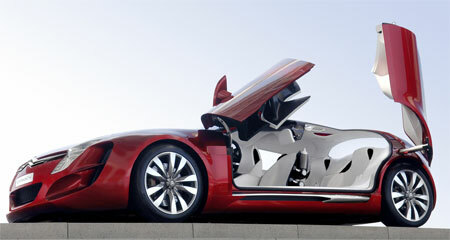 This gives the C-MÃ©tisse Concept 4WD capability. The HDi V6 turbodiesel engine makes 208bhp on it’s own, mated to a 6-speed automatic gearbox. Each of the electric motors powering the rear wheels put out 20hp and 400Nm of torque, which brings the total max torque output figures to over 1000Nm! Full torque is accessible immediately via an arcade-like boost function which activates under heavy acceleration. The front doors are gull-wing doors, meaning they open upwards rather than outwardsm while the rear doors spin round to provide easier access. Getting into the car, you are greeted by an aircraft-style cockpit, with nice luxurious white leather seats. Check out the headrests which are anchored to the ceiling of the vehicle instead of the normal position on top of the seats. 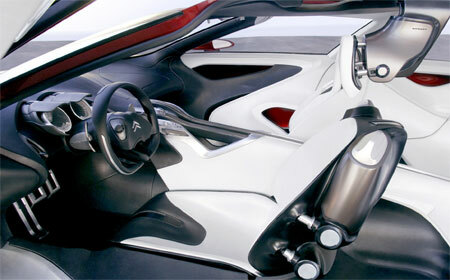 The Citroen C-MÃ©tisse Concept car which weighs 1,400kg including batteries for the electric motors goes from 0-100km/h in 6.2 seconds. There is also a ZEV (Zero Emissions Vehicle) mode, which lets you run on the electric motors only without the combustion engine.